Akin to last year, presented here are my top picks amongst all the books I read this year. Most of the reviews are from the FBC site done by Liviu, Cindy or me, and similar to last year I have linked a couple of reviews of books which I loved but could not review over here. [The reviews are from a site which I regularly visit and whose reviews resonate with me]. And so without further adieu, here are my choices. 1. The Folding Knife by K. J. Parker – This book was by far one of the best books I have read in many years, combining an alternate historical world with fantastical characters and political intrigue K. J. Parker has shot to the top of my reading lists. What made this book extra special; was the main character Basso and his struggles in the political arena. K. J. Parker combined her trademark style with fine characters and hence emerged this book which I believe can be made into an excellent TV series ala “Dexter”. 2. Changes by Jim Butcher – Jim Butcher is another constant topper amongst my reading lists and this year was no different however this book utterly changed the series equation and now proclaims a dark future for next year’s entry. The cliffhanger-ish ending also makes one want to get one’s hands on the arc of Ghost story as early as possible. 3. Edge by Jeffrey Deaver – While Jeffrey Deaver is another top favourite of mine, his last year’s book wasn’t upto his standards, this year however was a whole different story, JD returned to his standalone novels with EDGE which can be easily counted as one of his best. It is also one of the best thrillers ever written. A cat & mouse story between 2 adversaries and with Deaver’s trademark twists and multiple endings. This book was a complete winner from the current thriller maestro. 4. Magic Strikes by Ilona Andrews – Magic Strikes is the third book in the Kate Daniels series and is the first book wherein the actual potential of the series which was showcased by the earlier 2 books but never fully realized, was resoundingly seen. Part dark fantasy, part thriller and a whole gamut of other things. This was the book which made me a through and through fan of this wonderful pair. 5. Inside Out by Barry Eisler – Inside Out is the second book in the Ben Traven series and is a vast improvement than the first one. This book can be picked up as a standalone and even though the main protagonist is hardly likeable. The best part about this book is its storyline and the political subtext which is written by the author, Barry Eisler is an intelligent man and herein he showcases how to write a good thriller whilst also putting forward a specific viewpoint without it being disruptive to the storyline. A brilliant political thriller and has a unpredictable conclusion with pointers towards the next book which could see a reunion of his earlier beloved characters from the John Rain series. 6. The Desert Spear by Peter V. Brett – The Desert Spear was the highly anticipated sequel to PVB’s debut the Painted Man & while that book has become an alltime favourite of mine. TDS had a pretty difficult mountain to overcome its predecessor’s expectations. While it did succeed on most fronts, it also left a lingering taste of being a setup up in terms of events for the 3rd book & hence climbs down a few notches from its veritable position in the top three. 7. The Silver Skull by Mark Chadbourn – The Silver Skull was Mark Chadbourn’s opening Salvo in the Will Swyfte Alternate Hist-Fantasy series. It was a much darker re-imagining of Victorian England and its battle with the Fey court who are as devious as legends foretell and deadlier than the human imagination. Bringing together a cast of characters and a quick paced plot MC fascinatingly showcases bits and pieces of history mingled with a fast paced storyline to give jaded readers a new series to follow and cheer for. 8. The Palace of Impossible dreams by Jennifer Fallon – The POID is the penultimate chapter in the Tide Lords saga & it is still a mystery to me as to how this exciting series is yet unheard of amongst many fantasy readers. Combining epic fantasy twists with political upheavals and also featuring a very varied cast of characters. Jennifer Fallon has written a most exhilarating storyline which still manages to surprise the reader at the climax of the 3rd book and now features a most world-deafening climax uniting all of the Tide lords. 9. Cold Magic by Kate Elliott – Cold Magic was a different kind of book for Kate Elliot, usually featuring a large cast of characters and a varied world. She chose to write in a more compact manner and utilized a first person POV to give an alternate world afflicted by ice and a tightly focused story. A vastly different read from her previous Crossroads trilogy, I look forward to the sequel Cold Steel which would reveal further about this character cast and world. 10. Procession of the Dead by D. B. Shan – POTD was a huge surprise for me, not having any idea about the book and the author’s style. Part noir thriller, part urban fantasy and wholly an interesting read. D.B. Shan’s take on a city filled with mystery and redemption was a exhilarating read and a fresh one as well, making its sequel a must read for me. 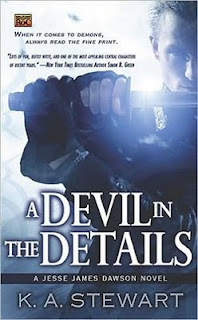 1) A Devil in the details by K. A. Stewart - This book was the debut of the year for me, an urban fantasy focusing upon a samurai warrior fighting demons is not quite original however the way Kari Stewart dwelled into the mind of J.J. Dawson creating an atmosphere for the reader which was exciting as well as familiar. Kari Stewart drew inspiration from her idol Jim Butcher and managed to surprise a variety of UF readers and drawing strong comparison with other UF greats. A very erstwhile debut with the promise of more mayhem to come, this book is what truly shone in the field of UF. 3) The Spirit Thief by Rachel Aaron - The Spirit Thief was a left field entry for me, totally unexpected and a whole amount of fun to read as well. It introduced a world wherein every inanimate object has a soul. Eli Monpress is the main protagonist and along with his band of followers who are unique and face further unique problems of their own. A light caper fantasy book though its sequels managed to add the darkness within the world. This book was a fun read and heralded the debut of a good writer. 4) Buddha’s Thunderbolt by Jacob Asher Michael – Buddha’s Thunderbolt is quite possibly the most understated book of the year featuring a storyline combing the Arthurian mythology with Buddhism. Author J.A. Michael has to be venerated for taking this difficult journey and giving us a rather unique storyline which while being a take on a very popular subject manages to come across a vastly different story due to the addition of certain unique elements. 6) Raiders from the North by Alex Rutherford – Raider from the North was a historical fiction book tracing the rise of the Mughal empire in India. The husband-wife duo had clearly done their research as they showcased a world wherein Babur amassed his kingdom and founded an empire. Its usually very hard to hinge one’s plot on just a single character but turns out very well for RFTN as this book also made its sequel Brothers at War a must read! 7) Dante’s Journey by J. C. Marino – This book was a bit of an oddity again as it was based on Dante’s literary work and updated to today’s current standards, coupled with the author’s vibrant imagination made this into a book which was really hard to define but a very good one to read. 8) I am not a serial Killer by Dan Wells – IANASK was Dan Wells’s debut and it instantaneously drew comparisons to the Dexter series of novels by Jeff Lindsay and its corresponding TV series due to its subject matter. What was thoroughly refreshing about this book was while the book featured a serial killer as its protagonist, the author has given the protagonist an anchor for his activities & by including the supernatural in his world. Wells definitely upped his ante and gave us a character who while a killer by heart, definitely had us rooting for him. 9) The Hundred Thousand Kingdoms by N.K. Jemisin – The 100K kingdoms is a book which though appearing to be a simple fantasy book is much more. N.K. Jemisin nuanced writing makes this tale a worthy one and gives us a world wherein Gods rule and interfere directly in the lives of inhabitants. The writing was crisp and the setting was engaging as well. A debut which heralded talent as well as an author who would be entertaining readers with her books for a long time hopefully. 10) Mob Rules by Cameron Haley – Mob rules made it on this list solely on two facts namely its settings in an urban LA and secondly because of its Parker-lite protagonist. Cameron Haley has a fair distance to go but there’s definitely a spark shown in this series debut which will have me waiting for the sequel in May. Ilona & Andrew Gordon- Their “Kate Daniels” is one the best UF series and whilst it has the traditional tropes in it, the best part about them is the witty writing and the full blooded characters and to top it off an apocalyptic world setting which acts as a fascinating character in itself due to its unpredictable nature as well. Kari A. Stewart – Kari Stewart debuted with Jesse J. Dawson and presented the readers with something which felt fresh and beloved at the same time. Her UF take on samurai culture and a warrior fighting demons for human souls wasn’t truly original, but what was refreshing was her writing and the characters. The JJD series is another new series which I’ll be looking out for in the future and the sequels when released will be must-reads for me. Dan Wells – Dan Wells surprised a lot of folks with his books and hopefully will be giving a fitting conclusion to the Cleaver series in this year’s “I Don’t Want to Kill You”. Superb characterization and an active imagination have made Dan a writer to look out for. Also keep an eye out for his next possible book called “Pain of Glass” and to learn more about it head over here and read the last Question. Rachel Aaron – And Lastly the mantle falls to Rachel Aaron who with her quirky but addictive books has proven that you really don’t need to write what’s currently popular but give the readers a funny story paced with good writing and you have a winner, her Spirit books make for light classical fantasy but she has enough surprises loaded along the way for jaded fantasy readers to jump in and not cringe at the thought of another 5 book series. With the first 3 books coming out in quick succession, the Spirit saga has won me over and I look forward to its conclusion this year & for whatever Ms. Aaron has to offer in the future. Completely agree on Rachel Aaron series. It is really fun to read the books. I really did like the light-hearted tone of the books and of course Eli is really special!! 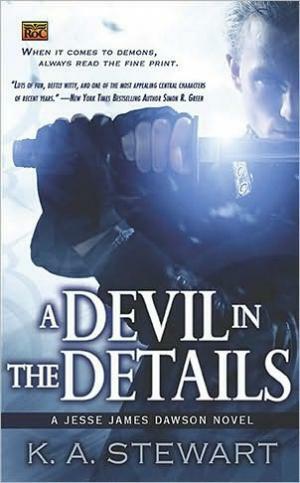 Kate Daniels (Ilona Andrews) is another series to really look forward to. Thanks for this. Great list. I loved "The Folding Knife" as well. I haven't read a ton of the other books/authors on your list but it's a good place for me to start various explorations. I really appreciated the first 14 "Best of 2010" lists on FBC, but now I'm finding them wearisome. We're well into 2011 now, folks - you've summed up 2010 ad nauseum. Thanks, it was fun to compile it. Its a list, the regular reviews will be back on the weekdays.